Salon style hair seems to be the universal theme for most consumer hair care brands. 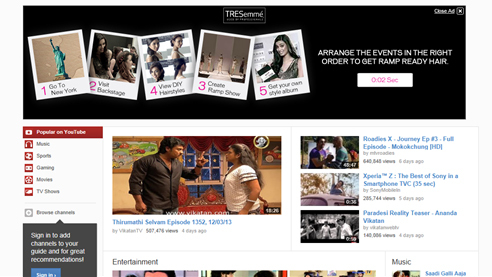 We have seen Sunsilk’s deep brand integrations and engaging executions on Youtube for its Keratinology range and now TRESemmé, the latest entrant in the hair care space, has come up with a similar execution on the same platform. Considering both the brands come from the HUL stable, some differentiation in the product range and eventual campaign execution, would have helped. If there is, it is not immediately apparent. 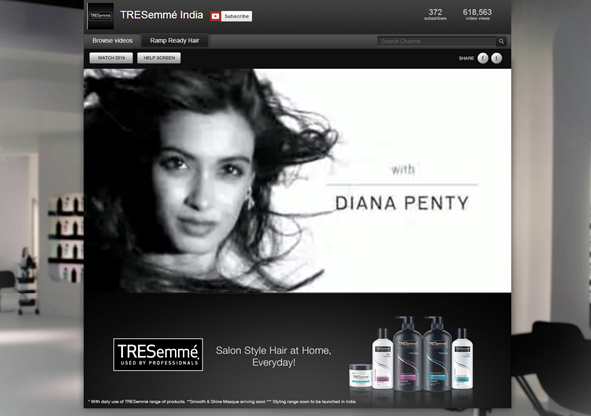 The TRESemmé India page on Youtube called ‘Ramp Ready Hair’ uses videos of celebrity endorser Diana Penty, shot specially for this initiative *kudos*. It takes users through the backstage of Mercedes Benz New York Fashion Week and gives them options to check out DIY hairstyles at the TRESemmé Salon. The step by step detailed videos are very well put together. There are also elements of personalization which include adding your picture to create an access card to the Fashion Week and picking the hairstyles you like and creating your own fashion show. A Style Album also brings together on-trend hair-dos that would work with your hair type. A very well put together execution. I even liked the simple Youtube Masthead which was about getting the right sequence of events on the banner.